Copy all your old Vinyl LPs, Cassettes & Minidiscs to an Apple Mac using our transfer kit - one end plugs into the headphone socket on your player, the other to the USB port on your Mac. Once the tracks are on your Mac you can burn them to an audio CD or import them into your iTunes library. Our kit contains all the leads, software and instructions required for the job. With this kit you can easily. • Transfer vinyl LPs and singles to a Mac. 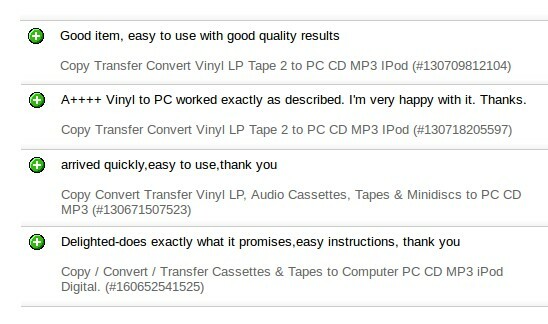 • Convert old audio cassette tapes to MP3 audio files. • Copy minidiscs to your iTunes library. • Listen to all your old LPs & tapes on your iPod/iPad/iPhone/Mac. • Import rare audio books & language tapes to Mac. • Preserve precious audio tapes of family members. • Make backups from dictaphone microcassettes and digital recorders. • Record direct from electronic musical instruments. • Record direct from mixing deck's headphone output. • Clean up audio. Remove hiss, tape motor noise, scratches, pops & crackles. 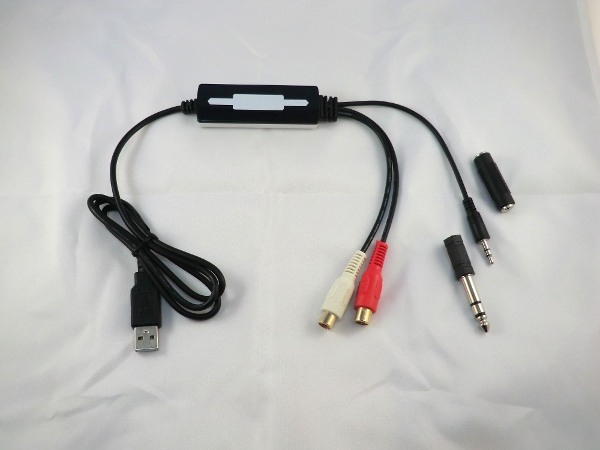 USB Audio adapter with 3.5mm and phono inputs. 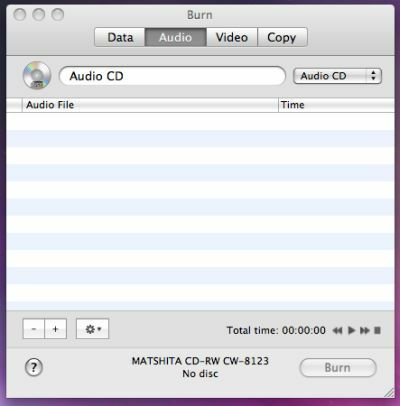 Burn OSX: Open-source audio CD writing tool - lets you burn the captured .wav files to regular audio CDs. Tested with all versions of Mac OSX. Why spend £80 on a USB turntable and another £100 on a USB cassette deck? This kit gives great results using your existing stereo ( regular headphone socket required ). Portable music centre, or Minidisc player. 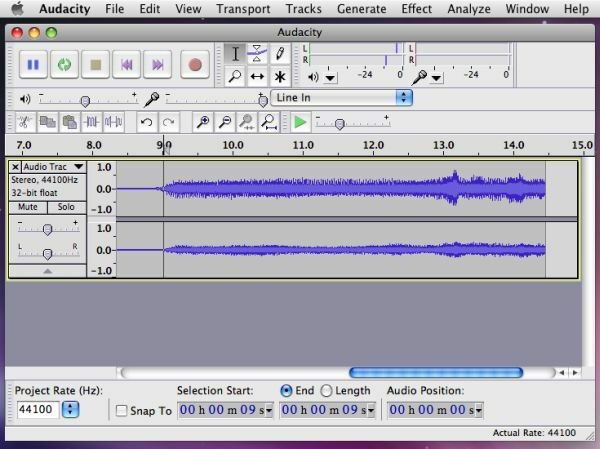 Alternatively, you can connect the phono outputs direct from a turntable and post-process the recording using Audacity on the Mac - our video guide shows you how. Vinyl-2-Mac is supplied in a plain white box & includes the items shown below along with a CD & printed instructions. Q. Does the USB adapter work with all versions of Mac OSX? Q. Don't I need a pre-amp for my turntable? A. No. You can connect our kit to the headphone output on the amp, or direct to turntable's phono outputs. If you record direct from phono outputs on a turntable, then some simple post-processing is required in Audacity - our video guide shows you how. Q. My brand new Mac doesn't have a CD/DVD drive. How do I load the software? A. We provide a digital download link printed on the paper CD sleeve. Q. How good is the audio recording software? A. It's the best package available for this job. It's used by more people than any other. Q. What's the quality of the recording like? A. Plug headphones into your stereo or portable player. What you hear is reproduced exactly on the Mac. Q. What devices can I record from? A. Record players, cassette decks, minidisc players. Anything with a headphone socket. Or a mains powered turntable with phono outputs. A. We supply a set of easy-to-follow printed instructions & a 30 minute tutorial video. We make it as easy as possible. Q. Where can I get some free Cloud storage for my captured music? Q. Is Vinyl-2-Mac available elsewhere? A. We only supply Vinyl-2-Mac through this site, Amazon and eBay. Price includes VAT, receipt provided. Royal Mail UK Post & Packing cost is given below. Please allow three working days for UK delivery. We can also post this item insured worldwide from �10. Payment accepted by Debit or Credit card using the cart buttons below. If you prefer to order by phone, please call Tim @ TR Computers on 01565 640739. If you aren't completely delighted with our kit you can return it for a full refund, within 28 days of receipt. If you just want to convert audio cassettes and don't have a tape player, then please take a look at our Walkman-style USB Tape Player for Apple Mac users - available from Tape-2-Mac, eBay and Amazon. We also sell a Video-2-Mac kit - copy all your video tapes onto your Mac too, for �39.